The Ideal MBBR-DAF doubled-down system provides the highest possible removal of soluble organics and suspended solids with the lowest possible footprint. Alchemist Brewery is a Vermont craft brewery best known for its award-winning IPA Heady Topper, which drove the need for a larger brewery and retail sales center. The brewery operates with a profound respect for environmental responsibility, so with a new facility in the horizon, there was opportunity to explore wastewater treatment system options that would allow them to minimize their impact on the town’s wastewater infrastructure. The brewery worked with Weston & Sampson Engineers to find a system that would meet the needs of the new facility, initiating the partnership with World Water Works, Inc.
Breweries use large amounts of water in the production and packaging processes and traditionally produce between five and seven barrels of wastewater for every barrel of beer produced, which can cause a significant environmental impact. When it came time to construct the new Stowe facility, Alchemist Brewery chose to build with improved wastewater treatment in mind – aiming to reduce its ecological impact and improve efficiency. Additionally, the brewery needed a system that would help the facility meet domestic effluent levels for BOD and TSS and permitted effluent limits for TP. World Water Works’ Ideal MBBR-DAF advanced water treatment system provided the perfect solution by combining moving bed biofilm reactor (MBBR) technology and dissolved air flotation (DAF) technology. The Ideal MBBR-DAF doubled-down system means the highest possible removal of soluble organics and suspended solids with the lowest possible footprint. The Ideal MBBR-DAF system was installed at the Stowe, Vermont, location following production in World Water Works’ manufacturing facility in Oklahoma City. The system was delivered and up and running with plenty of time for testing before the brewery would open in July 2016. This project required a solution that would meet an array of needs for the facility by being environmentally friendly, improving removal efficiencies, and giving the facility a long-term solution with a minimized footprint. The Ideal MBBR-DAF system has enhanced the brewery’s ability to handle wastewater and reduced the amount of BOD, TSS and TP discharged to the Stowe Wastewater Treatment Facility. 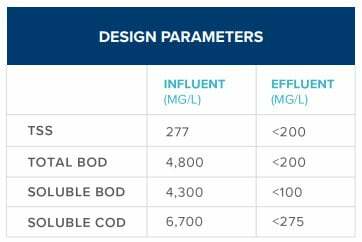 The new system consistently outperforms the design effluent criteria and has reduced the BOD to equal the level of approximately five households. In 2017, Alchemist Brewery was awarded the Outstanding Industrial Facility Award by the Green Mountain Water Environment Association for its commitment to clean water and pollution prevention, including implementation of water or wastewater treatment changes to address frequent issues that arise within similar industries.